Smoke tree is an ornamental shrub to small tree that is grown for the bright purple or yellow leaves and the spring flowers that mature and “puff” out as if they were clouds of smoke. Smoke trees tend to have a rangy, splayed growth habit. Pruning smoke trees annually will help make the plant more compact and strengthen the limbs. Trimming smoke trees can be done in late winter or very early spring. As a general rule, pruning smoke trees for shape is done in very early spring when the plant is still mostly dormant and the process will create less stress. Summer flowering trees such as smoke tree need to be pruned before flower buds have shown. The rule for pruning deciduous flowering plants states that if it flowers after June 1, like the smoke bush, you need to prune in early spring. Smoke tree pruning can also be done in late winter if you wish to rejuvenate the plant and cut it all the way to the ground. The method used when trimming smoke trees depends upon whether you want a tree or bush. For a tree, you need to start young and remove all the extra stems, leaving only one strong central leader. You can shape it at this point and keep the plant below a certain height. General pruning will include removing old wood, diseased or broken plant material and managing any suckers and water spouts. Any crossed branches need to be removed to prevent crowding and rubbing. Smoke tree pruning for a bush is much less laborious. You may allow the extra branches and simply prune limbs to manage shape. 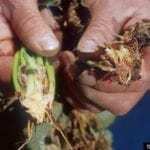 The natural splayed nature of growth can be amended by cutting the plant almost to the ground in late winter. 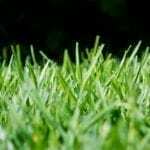 This will force new growth and tighten the overall look of the bush. When you remove any of the main trunks, always cut to the base of the tree. Very small, unproductive twigs and branches should be removed from the center to create air flow and allow established wood room to grow. Prior to pruning you need to make certain your implements are sharp and clean to prevent spreading diseases. 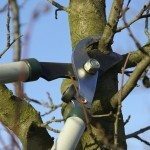 When you need to remove a limb or large piece of wood, cut cleanly at a slight angle ¼-inch outside the branch collar. The branch collar is the swelling in the parent branch from which the secondary branch grew. Cutting this way prevents cutting into the parent wood and introducing pathogens. It is rarely necessary to tip prune when pruning smoke trees, but if removing small amounts of wood always cut back to just before a growth node. This will prevent dead ends and create balance when the node sprouts. 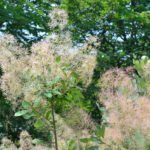 Read more articles about Smoke Tree.